Water will always be synonymous with putting out fires and whilst there’s many variations of fire extinguishers now on the market that use different substances, water fire extinguishers still remain one of the most effective on offer. Despite many other types of fire extinguisher being available, water fire extinguishers are still highly popular due to their low price, capacity to rapidly reduce flames and penetrate surfaces, and because they’re environmentally friendly. As with all our products and fire safety equipment, at the Safety Centre we’re always looking to offer our customers the best solutions at an affordable price and we’ve done it again with our water fire extinguishers range. Our customers are given a great selection to purchase from, whilst all 5 options adhere with all current European legislations as well as being13A rated. However, we’ve also been able to go do even better than that with the Thomas Glover 9 litre fire extinguisher which has a very impressive 21A rating. 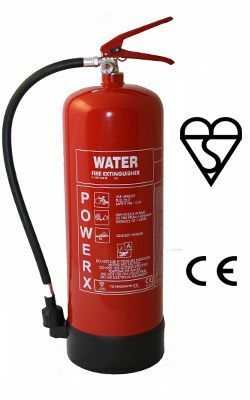 Available for the super low price of £27.52 having recently been reduced in price, this Thomas Glover water fire extinguisher is designed to discharge a steady stream of water over the source of flames. This works well to lower the temperature of burning material under the point of ignition. The product can be used on flammable solid fires which so it’s effective for combustible materials such as wood, paper and plastic. If you want to know more about this excellent water fire extinguisher, simply get in touch with the team at the Safety Centre when you call 01200 428 410. Don’t forget that we also provide a great range of fire alarm detection systems – choose one today!